BRCA1/2 mutations represent approximately 5 % of unselected Chinese women with breast cancer. However, the breast cancer risk of Chinese women with BRCA1/2 mutations is unknown. Therefore, the aim of this study was to estimate the age-specific cumulative risk of breast cancer in Chinese women who carry a BRCA1 or BRCA2 mutation. Our study included 1816 unselected Chinese women with breast cancer and 5549 female first-degree relatives of these probands. All probands were screened for BRCA1/2 mutation. The age-specific cumulative risks of BRCA1/2 carriers were estimated using the kin-cohort study by comparing the history of breast cancer in first-degree female relatives of BRCA1/2 carriers and non-carriers. 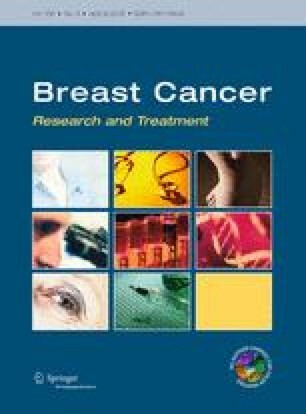 Among the 1816 probands, 125 BRCA1/2 pathogenic mutations were identified (70 in the BRCA1 gene and 55 in the BRCA2 gene). The incidence of breast cancer in the first-degree female relatives of BRCA1/2 mutation carriers was significantly higher (3.7-fold and 4.4-fold for BRCA1 and BRCA2 mutation carriers, respectively) than in non-carriers. The estimated cumulative risks of breast cancer by age 70 years were 37.9 % [95 % confidence interval (CI) 24.1–54.4 %] for BRCA1 mutation carriers and 36.5 % (95 % CI 26.7–51.8 %) for BRCA2 mutation carriers, respectively. Our study suggests that the breast cancer risk of Chinese women with BRCA1/2 mutations appears to be relatively high by the age of 70. Therefore, genetic counseling, enhanced surveillance, and individual preventive strategies should be provided for Chinese women who carry a BRCA1/2 mutation. This study was supported by the National Key Technology Research and Development Program of the Ministry of Science and Technology of China (no. 2014BAI09B08), the 973 project 2013CB911004, and Grants from the National Natural Science Foundation of China (nos. 81302330 and 81372832). The authors thank Dr. Hui Zhang (Beijing Institute of Genomics, CAS) for her help on data analysis.